Disclosure: This is a sponsored giveaway on behalf of Graco. Woohoo! It is finally summer time, and I am savoring every sunny sunscreen-slathered moment! This summer, I am trying to take the weekends off like a normal person—and stop working 7 days a week. Graco supports my decision. They think it’s a great idea. In fact, they want to ensure that DIY’er everywhere begin to pledge to save your weekend. Don’t waste these beautiful summer days painting the slow way. With a Graco paint sprayer applying paint is up to 10x faster than brushing and up to 4X faster than rolling! In addition to saving yourself time, spraying on your paint is also just plain easier. Setting up a paint sprayer only takes moments and using it simplifies your project because there are no messy trays or rollers. I’ve honestly been scared of sprayers in the past because I’ve heard that they are difficult to clean. Well not this one! The Graco sprayer cleans like a dream. You dispose of the plastic bag liner and run water through your sprayer to clean out the mechanism. In just a few minutes, your sprayer is clean and you are back in your lawn chair sipping a mojito :). But the best part of using a sprayer is NO PAINT STROKES! Yes! To find out more about this sprayer www.saveyourweekend.com. 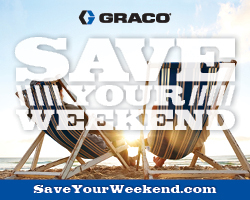 Would you like your own Graco TrueCoat Plus II Paint Sprayer so more of your weekends can be saved? 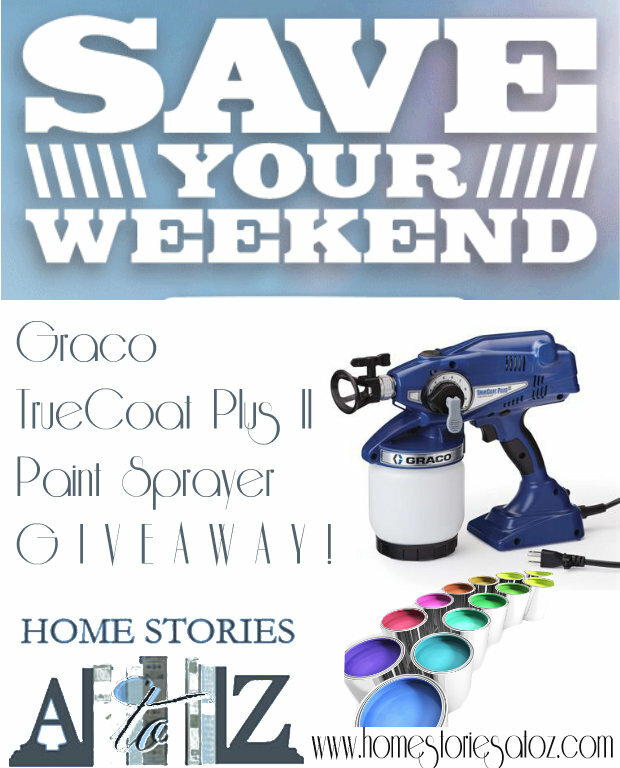 Well lucky for you Graco is giving away one paint sprayer to a lucky Home Stories A to Z reader. Follow the directions in the Rafflecopter widget below to enter. (If it doesn’t show up just give it a moment. Sometimes it’s finicky.) Good luck! And here’s to saving our weekends! the studies which showed dietary intake of saturated fats. substances within the oil and nourish as well as well. I am an owner of a painting Co…we need a good quality small project painter….for shutters trim etc….we will use it and then some! I will Be volunteering my time to repaint my church. This would be so helpful for all the doors and door jams. I will b doing this free of charge so the trucoat plus 2 would be a god sent! We have to repaint the cradle and crib we made for our first grandaughter Emilie in 2001 for our 3rd grandaughter due in late September! They have been through Emilie, Ashlynn, Ryder and need to be repainted for our new baby girl! I would go on a painting spree and paint everything! I’m working on renovating a house and everything needs painting! Like, all of it. My sister used a sprayer to do some painting and she swears by it now. I just bought a new house, so I’ve been in a PAINT ALL THE THINGS mood. This would definitely help! There are SO MANY things I would paint. But the first would be my adirondack chairs, which are in dire need of a good paint job! I have been looking to refinish a set of dressers and this would do wonders for eliminated brush strokes! We just replaced all our doors with white ones that are paintable — not painted!! This would be perfect!!! Our living room is in desperate need of a fresh coat (or two) of paint! I have a dresser that I would like to refinish. This would work great! I would paint our front door! I would paint my downstairs family room (finally got all of upstairs done!). I would love to paint with a sprayer. I usually won’t get it out because it is too much work to clean. This would save me so much time. Why is it that there is always something to paint! I would paint my grandparents cottage! It definitely needs a new coat after the terrible winter we had and they would have difficulty painting it. I would start by painting the house and privacy fence.. After that start on patio furniture! I would love to paint our doors white! Ooo! I want to paint furniture! 😀 Thanks. I have a trashed picked desk & dresser that could use this type of tlc!!! This would be amazing to have. I have so many furniture projects that need painting and i keep avoiding them for the obvious reason of it being such an undertaking but this would be awesome. This would make painting furniture 10 times easier! Definitely kitchen cabinets to white! :)) Would <3 this sprayer! Thanks for the chance! Cabinets. Much needed in my house! I would definitely be using this tool to save me time painting our privacy fence. wow- What a great give-away prize! Save my weekend! 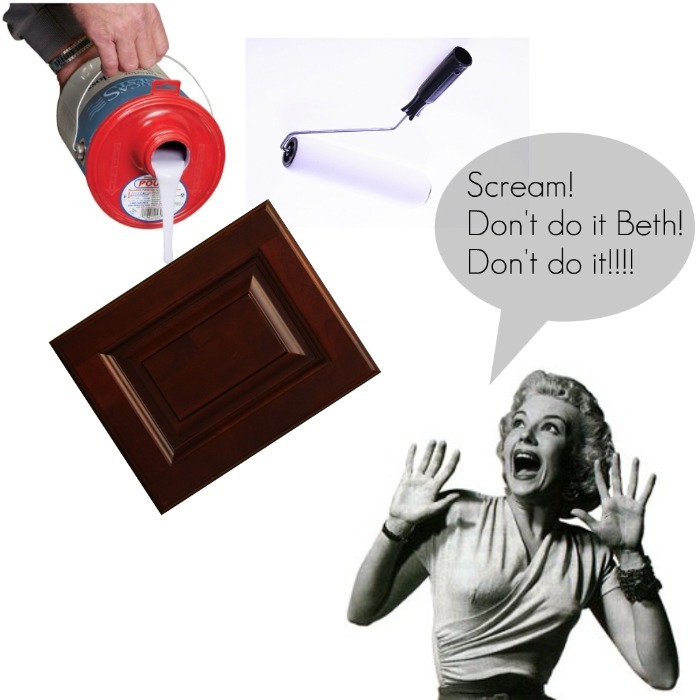 Baseboards, trim, doors….you name it & mine need new paint! I would LOVE to win! Time to paint all that ugly beige trim! we have bought paint to repaint the entire house and this would so come in handy we are doing the old fashion way thanks for this chance…. Yes. lol I have so many things I’d love to paint with one of these bad boys! Doors, picture frames, a desk, chairs, and a pegboard. I have two bedrooms and a bathroom to paint this summer! What wouldn’t I ? I have a dresser that is in need of a paint job( found on CL ). And I really want to do some exterior painting for our house. I couldn’t get my husband on board for this, but with the help of a spray painter, I’m sure I could handle it myself( some say I’m a brave woman, some say I’m crazy 🙂 ). Thank you for having this giveaway and Good Luck to Everyone! We bought our house over a year ago and it still isn’t re-painted. The guys who owned it painted it all these really dark, gaudy colors and painted all of the trim black. 🙁 I’ve been really wanting a spray gun to do the doors- all of them! Thank you for putting on this giveaway! I have a desk, a dresser and an armoire that need to be repainted! Help! our kitchen cabinets need repainting – this would save us sooo much time and effort! I would totally re-stain our fence…it needs it so badly, but would take so long to do with a roller! I have an antique bedroom suite waiting to be painted with this bad boy! I have a bunch of things that would be so much easier with a paint sprayer. I want to paint my glider, my son’s toddler bed, my bed frame. I’d help my sister redo her kitchen cabinets!! I love to paint and help my friends paint so this would be such a timesaver! I have a ton to pain and so little time with a 2 and 4 year old. Would love a paint sprayer. So much around here could use a fresh coat of paint! First priority would be the outside of the house, though. We just bought a new home, and literally EVERY SINGLE WALL needs to be painted. I haven’t even started yet because it’s so daunting, we also would need to paint the fence we just installed soon thereafter. SOOO many uses for this thing! I would pain the backyard fence. All the ugly gold fixtures in my house! I am a woodworker and I can find many things to paint. I’d repaint the stairwell- all those scuffs are adding up to ugly! I’d paint a Built in I made separating the dining from entry. we are painting our kitchen cabinets and every single piece of honey-oak trim in our home this summer, so we could definitely use one of these! I have tons of painting that needs to happen around here. This would be so helpful! I so could use it to paint cabinet!! I would paint my outdoor furniture! I’d use it to paint my house, the backlog of furniture projects sitting in my garage, my aunts house, and so on and so on…. I have lots of projects! I would start with the master bedroom–the walls and the furniture! I would start with my master bedroom–the walls, and the furniture! New trim in our home! I need to paint all the doors in my house. And, I also need to paint my back porch! I a getting ready ant my deck, my shed, and rooms in my house. Oh how I would love to have one of these. I would use this to paint some old furniture I have been planning on revamping! I’d paint in my sister and brother-in-law’s house wherever they need it! I’d love to paint our porch and wooden fences! I’m in a redecorating frenzy lately, transforming everything in my house from dark to light! I would paint my kids rooms and outdoor furniture. wow! i would love to win this sprayer. i’ve got lots of projects begging to be finished! This looks like it would be really fun to use! I’ve got a bunch of furniture that needs to be painted…then re-upholstered. Also need to paint my kitchen cabinets…PICK ME!!! my end tables and my desk then maybe the fence! I’m planning on painting my kitchen cabinets this summer, and this would make it soooo much easier! I really need to paint my kitchen chairs and maybe my night stands also. Have many furniture projects that this could work for. I would paint my guest bedroom! furniture! we’ve started painting some and it is a crazy mess that is taking forever. this would be a life saver! We have many rooms that need painted….including all our trim. We bought our house last year and have our work cut out for us! It sure would help cut down on time so we could get our project list done! I can’t tell you how much I need this!!! I have several thrift store furniture projects (to name a few) that my husband would be so happy to get out of the garage. The first project would be a lovely vintage nightstand that’s been waiting for a makeover. Crossing fingers and toes!! I have several wood pieces to paint, would love to get them done faster! I am doing a Dining Room makeover, and would love a sprayer to paint my dining room walls. Thanks so much for the giveaway opportunity!!! Fingers crossed! I SO want a sprayer to paint my doors and some wood furniture!! Projects needing to happen soon are painting all the metal outdoor furniture, 1 large and 1 smaller filing cabinets, some lamps, dining room table and chairs, an old rocker and several other things, but I’m tired just seeing what’s already on the list, LOL! Would love to win this! I would paint all of the interior doors in my house. They need it so badly but I am worried about paint brush strokes if I use a traditional method. This sprayer would be a great tool for that project! we are going to renovate the kids’s room in a few weeks. plans are made, paint is bought… a graco would save some precious time and thus my life! oh how i’d love to win! thanks for this great post and your perfect timing with the give-away!! I have 3 projects I’d like to get done this summer. My kitchen table & chairs, a vanity, and a coffee table. A paint sprayer would certainly be a huge help! Yeah! I have cabinets and furniture to paint. Plus all my crafty things. I have a dresser and desk that are in need of painting before my daughter can use them for her room. I’d totally attempt painting our trim and some doors with a paint sprayer! I have soooo many things to paint! I have a paint sprayer now but it’s terrible and always leaks. I’m looking for something better! Countless projects! We have a fixer upper! Let’s see… We’re going to be painting our 20 ft wall, our mater bedroom, my daughters bedroom and while we’re at it lets add the bathrooms! Awesome giveaway! I have a garage full of unpainted “treasures” just waiting to become more magnificent! This would really help! I would paint my kitchen cabinets and my bar stools both of which I am dreading painting. I would love to paint our white fence that runs the length of our 2.5 acres! I also want to repaint the shudders and the trim of our house. Let the summer begin! I would tackle shutters for our little cottage home. A sprayer would cut the paint time in 1/2!! Thanks for hosting this give away. Perfect timing. Im looking for mid century furniture on craiglist to furnish my small condo… this spray painter would make it a breeze to restore them… thanks a million!! I would love to paint my little guys bedroom furniture! I have a couple of tables, a few dressers, and some more tables to paint. Also, a couple of desks. First thing I would paint would be my daughter’s bedroom furniture! I’ve always been hesitant about paint sprayers cause like you I thought the clean up process would take longer than the prep and actual execution and then it would never be as clean as it should be but based on your recommendation this sounds like the one I’ve been waiting for! First I’d paint my deck so that I could sip my mojito without angsting about the deck’s need of paint. Then I’d spray the vintage buffet and vintage desk just waiting in my garage to be rejuvenated. Then I’d move on to….well you get it, like others I have a looong list of projects! I would paint some furniture and my guest bathroom. I’d paint furniture and shutters with this sprayer. This baby would keep me busy all summer! We desperately need to refinish (paint) our kitchen cabinets, our bathroom cabinets, all our ugly brown doors and trim, all the walls in our house, and several pieces of furniture. After that, we could start having fun with it! I inherited an old patio set with the house we just bought. This would be a huge help for painting it once I’ve refurbished it! I would paint my kids room. I want a lovely gray instead of yellows beige from the seventies. This would be perfect since we are moving into a new house this summer. I have several bedrooms to paint in addition to some DIY furniture projects! I’d paint our whole house! I’ve never used a sprayer, but I am starting to build my DIY tool set. What better way to start. Thank you for the giveaway. I would paint my kitchen and living areas on my main level. We are in the process of a big remodel and a sprayer would come in handy… Great giveaway! I have so much furniture that needs painting it’s not even funny! I actually have been looking to buy a paint sprayer, this would be so awesome! I would paint my bedroom, my daughters bedroom, and probably a BUNCH of furniture. I have quite a bit of wicker that I need to repaint this summer. I dread doing it by hand and would love a sprayer to help with the process. Thanks for the opportunity. I would paint my guest room. then go for the garage. The Graco TrueCoat Plus II Paint Sprayer is awesome and I got myself one already but wouldn’t mind another ! lol one for each hand. I would repaint my kitchen cabinets… my first job was not very smooth. I have some furniture in dire need of love too! I have always wanted a sprayer. Thanks for the chance to win!! I need to finish painting my daughter’s furniture. It’s way past time! My kitchen cabinets are begging for help! I would be all over the place with that thing, starting with my piano! Then the front door! I have two coats of new paint on my kitchen cupboards – painted by hand with a brush. Would love to apply the final coat with a spray gun. Pick me! Pick me! I have SOO many orange oak cabinets in my house that need a fresh coat of white paint, but after my DIY kitchen reno, I’m having a hard time mustering the strength! I have a thrifted table and dresser I would love to spray! My nesting tables for my master bedroom. I’ve always wanted to use a paint sprayer, I have lots of things to paint. I have a whole bedroom set for starters. I would paint our stairwell, it really needs it! I would love to win this! I’m going to be helping my mom paint her house this summer, this would really be helpful! Thanks for the chance to win! We are knee deep in project get this house sold and we are quickly approaching the painting phase! I love painting but for some reason my back begs to differ, go figure!! FIRST thing I’d paint is my wrought iron furniture on my back porch! But I have so many other things I could paint, too! Thank you for the giveaway! I am getting ready to stain the chairs on the front porch. If I win, I think I might be able to handle the porch as well ! I’ve got a whole list: My kitchen tables, chairs and paneling, my living and dining rooms, and my porch ceiling! I’d paint everything I could get my hands on!! 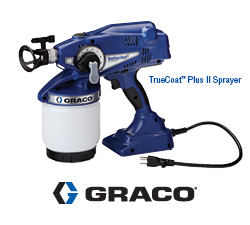 Just thinking about winning this GRACO TRUCOAT PLUS II PAINT SPRAYER makes me do my Happy Dance All Day Long !!!! I’m a renter so I can’t spray the house or door or any of that fun stuff…though I want to. I would spray FURNITURE! I have some great pieces that I’ve been wanting to tackle. I would paint our deck. I would prime and then paint the old IKEA dresser in our playroom…..it would look much better if it coordinated with the rest of the stuff in there! If I had a sprayer…..I would FINALLY tackle the project of spraying this old storage cabinet we have in the nook under our stairs….it’s used to house our sheets and towels, but it’s old and needs a facelift! The sprayer would give me the confidence to finally paint it and know it would come out beautifully! I would paint all the walls in my home. We will be selling it soon, and want to repaint everything. I have so many painting projects to complete this summer including the entire exterior of our home. I would paint some furniture and possibly my kitchen cabinets. I would paint my entertainment center! It would save a few weekends! We are planning to paint the kitchen cabinets and it would save so much time, not to mention no brush strokes! I would paint my hallway! Thanks! We have purchased a home that was never finished. So I have many projects. The doors, trim crown, kitchen cabinets. This would really be a time saver lots to do when you also work a full time job. I have so much painting I need to do and I have even bought paint for 3 of the rooms but have yet to get started. Maybe this is just the kick I need to get it into gear and paint, paint, paint! I need this! Not sure where I would start though- master bath or deck??? Thanks for the chance! We are remodeling our house so I would use it in three bedrooms, the living room and the kitchen! I so need this. I two dressers that I am going to paint and it screams for a sprayer like this. Thanks for chance. THIS IS AMAZING! I would LOVE to win this…So many projects waiting to be completed! My covered patio, my bedroom, kitchen and the list goes on and on. Many thanks for the chance to win! This would be SO helpful In painting our ceilings, our big summer project!! Oh, my, a sprayer has been on my dream-list for quite some time! I have kitchen cabinets that are calling out for a makeover! I would paint all of my outdoor furniture w/ this Graco paint sprayer. I planned on borrowing a sprayer from a friend so I would be so happy to win this. Thanks!!! I would paint every room in my house! I would use it to paint my kitchen cabinets—finally! Working on refinishing a dresser and turning it into a buffet. this would definitely help!!! I would paint a couple of lawn chairs and ottomans. omg the timing!!! i was just telling my husband i wanted a paint sprayer– and this one looks perfect for us, i might add– we have so much to paint this summer and a sprayer would make it so much quicker and easier to update the deck and stain the fencing, paint the patio furniture, the shed. then there’s my parent’s house, my sister’s house… it sure would get a workout at my house! this is such a generous give away, much thanks for offering it. We have begun looking at sprayers and just don’t know where to start, this one looks fabulous! I would use the sprayer to paint my deck! WOO HOO!! I’ve been looking at sprayers and trying to determine which would be the best for me, and this one looks FANTASTIC!! I have lots of great things just waiting for a sprayer; headboard, bookcase, chairs…the list goes on! Thanks for such a GREAT giveway! I would paint my garage – it looks horrible! and this would make it a 1 day job instead of 2-3 days. I would paint my living room, dining room, entry way, bedroom and my half bath. Those are on my summer to do list and so it would be great to be able to get those crossed off quickly! I would paint a vintage glider I found (yes, free! ); it would make it so much easier! Thanks for this opportunity! I would paint the cabinets that my husband is building(we don’t have a sprayer and I would love one), as well as painting all the walls in the house. My neighbors are always making fun of my painting projects. I have painted everything from chairs to tables to dressers to frames. A nice working paint sprayer would make it so much easier! I am repurposing several items this year to enhance my home and garden/patio areas. This sprayer would be a Godsend! If I don’t win it, I may have to buy one. I have so many projects to do! This would be lovely and it would save me so much time! Trim! Walls! Furniture! haha everything! Great giveaway! I have a buffet and a cabinet that both need painting! First order of business: painting our front door! Oh, I so want this! I would spray my kitchen cabinets, old dresser, and my living room walls. Just to start. Then move to my fence and my mini barn. I have SK much furniture I would paint. I would use the sprayer to paint all of the trim in my house. I would also use it to paint a few bureaus. That sprayer would have no rest over here! Ooooh! I’d paint my cabinets! I have SOOOOO many projects where I would use the Graco TrueCoat Plus II Paint Sprayer. At the top of the list is the front porch of my 1906 Victorian. I can’t even imagine trying to paint it with a brush! I would paint my sad looking kitchen table and chairs. If painting is easier using this sprayer, I’d probably paint everything that doesn’t breathe in my house. I’d start first with my bedroom walls, then on to my old, ugly dining room set. Thanks for a chance to win this. I would paint our kitchen walls & bedroom furniture. I’ve been talking about buying one of these to paint my shed. Winning one would be so much better! Thanks!! I would paint our shutters. They’re in rough shape! I would paint our outdoor patio furniture, my children’s table and chair set, and probably attempt to paint the porch ceiling. I hope I win! My end tables, maybe my fence, my hope chest!! Hi there, I would work on my master bathroom it needs lots of help! I’m working on a porch with spindled banisters. Wow, would this make it a lot easier! Thanks for the chance. Hi Beth, We just installed new doors, casing, baseboards and shoe trim, and I would love to be able to spray instead of brush! I am going to be painting for my son and daughters bedrooms. I said I was going to paint at least one room in my house this summer, but with this, I could paint them all, I bet!!! Starting with the living room. Paint sprayer could help me paint those items that are just too intricate for hand-painting with a brush and roller. We are painting the exterior of our house this summer so the paint sprayer would sure come in handy! We have TONS of stuff to paint in our new home but it’ll never get done because it takes so long with a 1 year old and a 2 year old. We wait until they’re asleep and stay up all night to get some stuff done but it’s taken its toll on us. Our imaginations were not very realistic so we went thrift store shopping for EVERYTHING for our home thinking we’d get it all painted nicely, but it’s not happening. We’re beyond exhausted so we put our entertainment center, side tables, dining room set, dressers for the nursery we didn’t get to start, and more into storage for now. It’d be amazing to win this because if it doesnt take so long to paint things we could actually have furniture in our house! Imagine that! Where to start….I would paint eveything in my house. What a fabulous giveaway. I would LOVE this! I can’t imagine how often this would be used. Wow. All the time! This would make life so much simplified and give me more time to do other things & I know I can use this with many of the other projects I have sitting around the house just waiting for me to get the time or the energy to complete them. Oh man I have always wanted one of these, I have a fence that needs painting !!! I would use it to revamp my desk like the one in the Lowes Creative Ideas Magazine I just received today and I would love to repaint my bedroom. This would make my life so much easier to get some of the projects I have done a lot faster since I am disabled and it is hard to climb ladders or reach over my head without getting a sharp pain going from top to bottom. My creative side is imagining so many things I could use this. I would definitely paint the dressers that have been in my garage waiting for some action for almost two years now. half of my garage is filled with To Be Started projects. The spray painter will definitely kick start my motivation! We’re about to buy our first home, so what wouldn’t I paint? Right now, though, I am itching to paint my sewing table and my boys’ dresser. I have so many projects but first on my list would be my sons room. He leaves for camp in a few weeks and I would love to surprise him. We have SO much painting to do in the near future. Every wall in our house and lots of furniture! I so want this we are painting our kitchen cabinets, all our doors, and several pieces of furniture! Our basement paneling needs to be painted! I don’t have much to paint this summer, but I will be painting our basement walls and trim all by myself when we move in to our house this Fall. I would LOVE to have this sprayer to speed things along! Thanks for the giveaway Beth, it sounds like a really nice sprayer! I have several pieces of furniture that need painting. My kitchen cabinets are in desperate need of a facelift! I have wanted one of these for several years. Glad they figured out the easy clean up. To answer your question about what I would paint… Everything and anything I could get my hands on and wrestle out of my husbands hands. I could really use this sprayer for a British phone booth project I am working on. Who doesn’t love having drips! I would paint the garage! Ack! I so need this wonderful tool. Now that school is out for the summer, I am ready to tackle my “project list” and begin painting our kitchen cabinets. I am ready to have a pretty kitchen! We have a 1 year old house that is still dreadfully builder beige in most areas so I would use it to start fixing that situation! My bedroom furniture and my sons bedroom furniture!! Oh yea baby! I would so love that Graco sprayer! Fun giveaway Beth! Right now I have a hutch, a buffet and a china cabinet that I am painting…I really would love to try this! I have been thinking about getting a sprayer, I am glad to know about this one. I am working on refinishing some furniture, would be perfect!! I would paint our deck and patio. It needs a lot of work! I would paint our master bedroom!! OOOhhhh I have kitchen cabinets to paint, and a ton of smaller projects this would be perfect for! I would paint anything that stood still long enough! Perfect timing! This would help my to-do list get done sooooo much faster! Thanks for the chance to receive this AWESOME product! I’ve heard these are the best sprayers to use. I have a huge china cabinet to paint and this would make it a lot easier. I would paint cabinet doors super fast & smooth for my upcycled signs! Would make quick work of painting tedious trim! I would paint a dresser for our master bedroom, then paint the girls dresser for their bedroom. I would paint all the doors in my house! They are all this awful buttery yellow white color. The wood paneling walls at my Dads house! My front porch columns, mailbox, front door, back door, etc. Awesome giveaway! My patio furniture is at the top of my very long painting list! I would paint my front door first…..then line up the metal chairs from our church that need some life breathed into them! I want to paint my dining table. My kids happened to it. I would spray the trim and cabinets in my house! I could really use this since we are repainting our kitchen cabinets this year. Thanks for the giveaway! Now that we’ve finally Chosen a color we need to paint our living room and kitchen. I would paint my mid century nightstand that I got at a garage sale. I would also paint all of our baseboards in the house. We are replacing our floors and need to pull up the baseboards so why not paint them too. My dining room table! I’ve been dreading it, especially because I am worried about ugly brush strokes! I have some tables I would love to paint with this! Thanks for the opportunity. Oh my goodness, I would paint so many things… let’s see, the kitchen cabinets, the bathroom walls, the beat up furniture all over my house. Everything! I have so many projects that I could use this spayer on! Thanks for the chance. I have so much to paint this summer because I’m moving and have bookcases that need to be painted and want to paint every single room!! This would be awesome!! I’ve got a whole garage full of furniture pieces that this would make sooo easy to give a new look 🙂 Great giveaway!! I love to makeover furniture, so I would definitely be using the sprayer for that! I have a roll top desk that I’ve been wanting to paint for a while. I think a paint sprayer would be just the ticked!! I would paint the table on my patio to match my new seating area! Want….Want….Want!!! I am replacing all the door, window and baseboard trim in my house, priming and painting before installing. This would really speed up the process, and make it look great also. I would paint my new deck! I would paint my living room…and maybe some furniture!